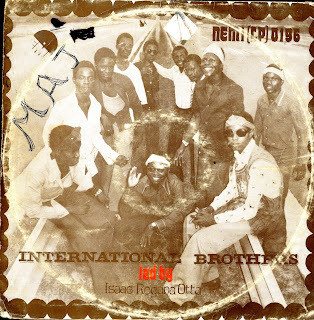 For the next selection on the highlife turntable, I have selected the track Anyi Bu Ndegwu from the International Brothers led by Rogana Ottah LP on the EMI label. I first saw this LP about 6 years ago when I heard it when I was visiting Chris Meserve in NY. I was never able to record the record, but I finally got a copy. The International Brothers were a loose confederation of top Ukwauni musicians and they did a series of very well regarded LP, usually featuring a guest vocalist like Bob Fred or Steady Arobby. This release features the great Rogana Ottah. Rogana Ottah has always been a personal favorite of mine. He's recorded 31 LP's, and I have 25 recordings, and by and large all of them are very good. I love the rawness and energy of the vocals and the guitar lines are impeccable. It reminded me of what I really liked about Rogana Ottah's singing and the simplicity and beauty behind a well played Ukwauni bass line. See what you think. stephanie - I reposted the fax clark link. I am glad you liked it. Really cool!Thkx a lot. St. Sorry Ubulujaja, it's me again : I don't see no more your ADrive link for the Fax Clark 7"? slj3 - please email me at the inbeatswetrust email address listed below the copyright notice so we can talk. For copyright reasons I do not post downloadable tracks any more on the site.